Florida Panthers NHL hockey players Aleksander Barkov, left, of Finland, and Derek MacKenzie pose after a practice session in Sunrise, Fla., on Sept. 17. 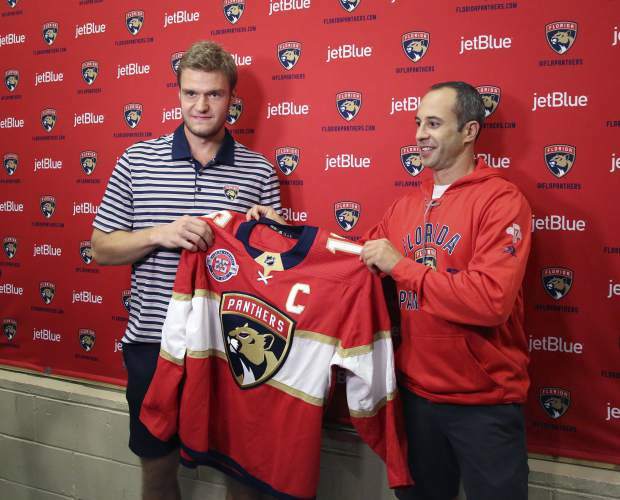 Barkov is the new captain of the Florida Panthers. Barkov is taking over for forward MacKenzie, who held the role for the last two seasons. For more than a century, NHL teams have named one player the captain, equipment managers stitched a “C” on his jersey and, if all went well, he was the one who’d accept the Stanley Cup and lift it first. It’s still a hockey tradition with special meaning at all levels of the game, but almost one third of the 31-team league could go into opening night without a captain, a sign of the times that it’s no longer a necessity and certainly not a distinction that management and coaching staffs want to jump into without a lot of thought. Teams certainly aren’t afraid to make big decisions with their captains. Within the past two weeks, Montreal traded captain Max Pacioretty to Vegas and Ottawa traded captain Erik Karlsson to San Jose, Carolina abandoned its two-captain system and gave the “C” to Justin Williams and Florida promoted Aleksander Barkov to succeed Derek MacKenzie as captain. The Islanders (post-Tavares), Rangers (after trading Ryan McDonagh last season), Golden Knights, Maple Leafs, Sabres, Canadiens, Senators and Canucks (after Henrik Sedin retired) all have vacancies, and the Red Wings are in a similar spot because captain Henrik Zetterberg’s career is over because of injury. Consider them the AAA club because without a captain, three players are alternates each game. Bruins defenseman Charlie McAvoy said the “C” could be cut up and a slice given to captain Zdeno Chara and lieutenant Patrice Bergeron. The Kings made a seamless transition from Dustin Brown to Anze Kopitar and the Sharks have thrived with ex-captain Joe Thornton and current captain Joe Pavelski co-existing and developing what Evander Kane called the best leadership structure he has ever played under. More often than not it’s simple: Jonathan Toews has won the Cup three times as Chicago’s captain and unquestioned leader. But he even doesn’t think naming one captain is essential based on his years of help from players wearing “As” like Duncan Keith, Brent Seabrook and Patrick Sharp.